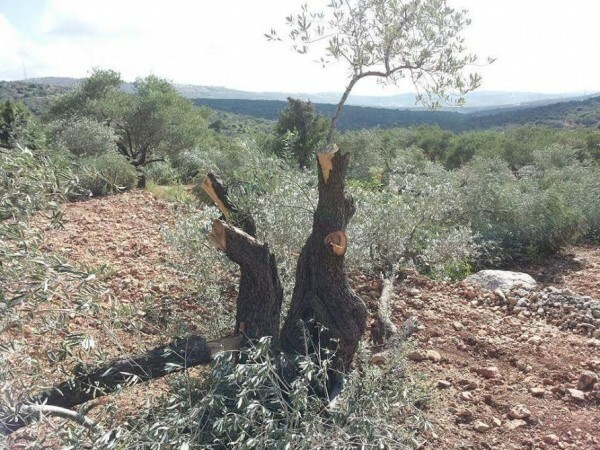 On Sunday, 21st of June, residents of the Jamma’in village in the Nablus region discovered that Israeli settlers had cut down over 60 Palestinian owned olive trees. They suspect that the trees had been destroyed the previous day with a chain saw. 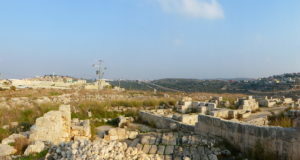 The trees were owned by farmers from both Jamma’in and Yasuf, both villages are situated close to each other just south of Nablus. 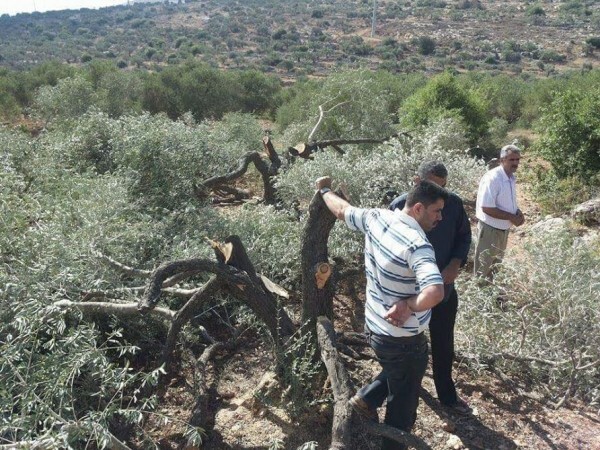 Palestinians with the olive trees cut by the Israeli settlers. The olive trees were said to be over 150 years old and have been harvested by generations of the Zeiden family, as well as others from the Yasuf village. 40 of these trees belonged to three brothers from the Zeiden family, who when witnessed the destruction to their land said, ‘We have lost our livelihood’. With the olive harvest only a few months away, this year the family will lose a major portion of their income from the production of olives and oil. The brothers explained how devastated they felt after seeing the trees cut down. They said that after they themselves had spent tens of years seeing that the trees were well kept and healthy, and then harvesting them yearly, it wasn’t only an economic catastrophe but also emotionally traumatic. For the brothers, and other locals, the trees had become symbols of years of memories, which they have now lost. 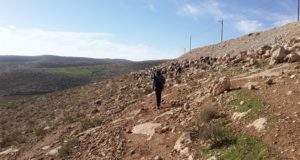 Yesterday, another resident of Jamma’in accompanied a Palestinian agricultural development group (PARC) to the area but were stopped by Israeli military who had blocked the road leading to the land. After finding another route, the group documented the destruction. 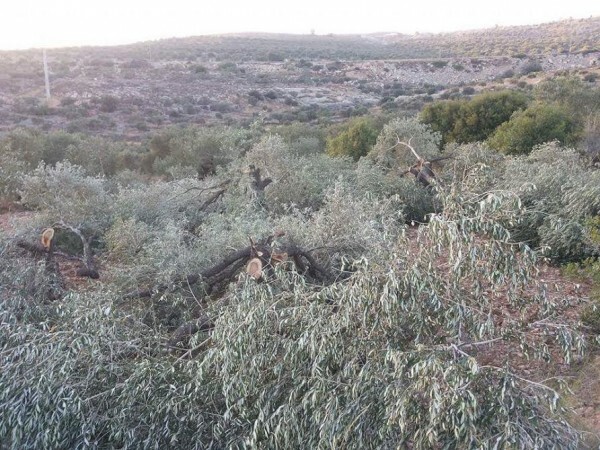 They described it as very upsetting to see the tree branches laying on the ground with the olives almost ready to harvest, ‘We were very sad to see that the trees had been cut and were completely destroyed so close to the harvest time’. 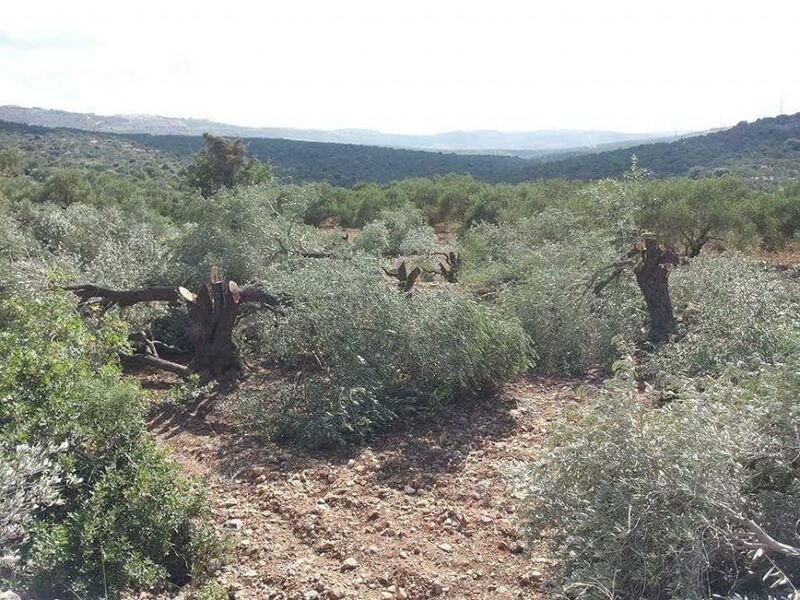 The damage that settlers did to Palestinian olive trees. The land surrounding these villages has also been targeted in the past. Two years ago Jamma’in residents faced a similar attack from Israeli settlers who destroyed more of their olive trees. Not only have the settlers targeted the local livelihood but they have also been physically violent. There are regular attacks on farmers throughout the year but they face more danger of settler violence leading up to and during the olive harvest. 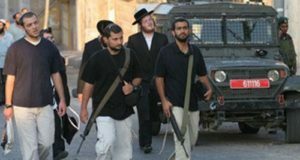 Many locals label the settlers from the illegal Kfar Tappuah settlement terrorist because of their repeated use of excessive violence on unarmed civilians. The 505 road that connects Tel Aviv and the illegal settlement Ariel also causes continued issues for Palestinians living in this area. The Israeli settlers often stop their cars when passing Palestinian farmers, or anyone trying to cross the road, to intimidate them by brandishing their weapons and shouting abuse. The farmers with land close to the road and settlements have also been physically attacked and had their crops stolen by settlers during the harvest. The Israeli occupation forces do not intervene during these attacks and in this instance it is presumed that Israeli courts will claim the trees were cut by an unknown person, meaning the farmers will be unable to receive any compensation. All photo credit goes to Jamma’in municipality.